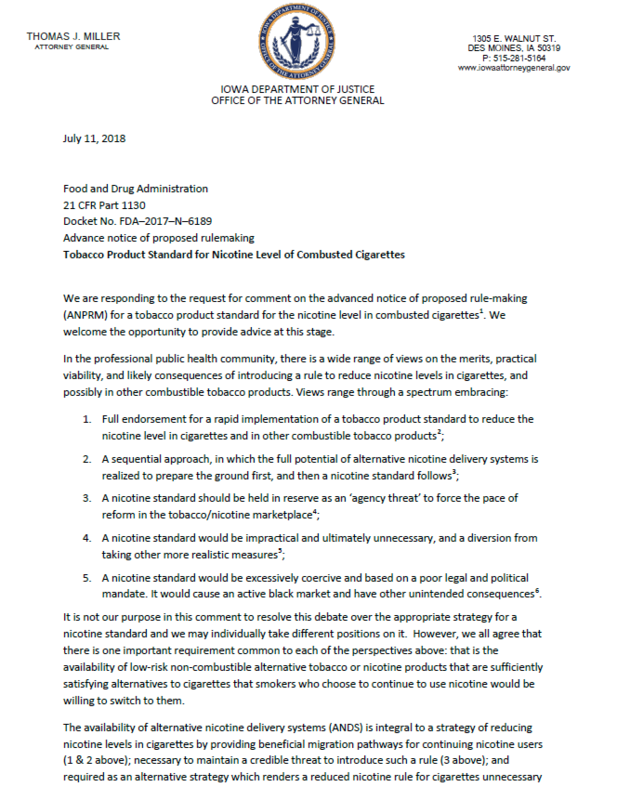 Iowa's Attorney General (A.G.) Tom Miller has officially issued a response to the U.S. Food & Drug Administration's plan to mandate a reduction of nicotine strength in cigarettes. While the response is aimed to address the growing smoking problem, this response is actually beneficial for the American Vaping industry as well in that the A.G. hopes to shed some degree of logic in the FDA's rhetoric. What A.G. Miller effectively outlined is that the FDA cannot just strike down the tobacco industry without first setting in place a logical sequence of events to actually regulate the industry. A.G. Miller is not only criticizing the agency for their ambiguity, but also slamming the FDA in their inability to make logical decisions based on strong mandates imposed by the legal and political system. In essence, the FDA is and will continue to act unconstitutionally - and coming from the legal reasoning of an Attorney General, that's embarrassing. This response can be considered a win for the American Vaping industry in that the A.G. even goes so far as to embrace harm reduction alternatives such as vaping and heat-not-burn systems. A.G. Miller's position embraces the vaping industry as a necessary precursory step in introducing the FDA's nicotine standard because it sets the precedent that the public health agency is ready, willing, and able to provide users with a healthier alternative BEFORE it strips away nicotine levels. Let's hope the FDA heeds Attorney General Miller's response in crafting its regulations, now that the official comment period to the Advanced Notice of Proposed Rulemaking (ANPRM) is over.